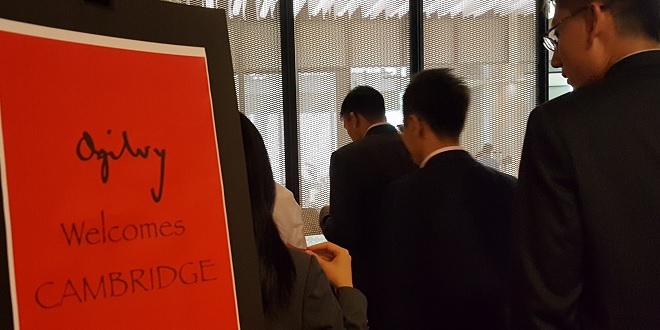 There was a sense of anticipation in the air when the thirteen of us met for the first time during the briefing for the careers trek to Singapore. Everyone was enthusiastically sharing the Colleges that they will be staying in and when they would be arriving in Cambridge. After our briefing, we headed out for a Swedish dinner to socialise further before calling it a day. We started the first day with Mapletree, a leading real estate investment company. Even though it is headquartered in Singapore, I am impressed with its global outlook as it has an investment portfolio that spans from Australia to the US. It is definitely a company to explore if you are interested in specialising in real estate. We went on to explore Millward Brown Vermeer, a WPP-owned marketing consulting firm. We were greeted with pizzas which filled our empty stomachs and energised us for the rest of the day. It is eye opening to learn how they generate the insights and successfully contribute a meaningful impact to their clients. The last company visit for the day was Microsoft, where we learnt about its constant innovations to remain competitive. We also got to tour around their spacious office where we learnt about their hot desking policy and opportunities to telecommute. This really showcased the ability of their software to enable work to be done away from office effectively without compromising quality. We ended the first day with a gathering that was organised by the JBS alumni community based in Singapore. While being treated with beer and finger-food, we learnt more about the alumni’s experiences at CJBS and advice on how to make best use of the MBA programme. I can really tell that they enjoyed their time from their constant reminiscing! Although many of us wanted to carry on socialising, we had to part ways to catch some much needed sleep as it would be a long day ahead of us for the second day of the trek. After a good night’s rest, we eagerly stepped into Ogilvy office and were instantly greeted by a sign post that says “Ogilvy Welcomes Cambridge”; a really nice personal touch to welcome us. They blew us away with their extensive showcase of interesting and thought-provoking campaigns that they did for their clients. No wonder they are one of the best marketing and advertising agencies in the world. Google was our next stop for the day and it certainly lived up to our expectation as being a fun and dynamic technology company. Table tennis room? Check. Sleeping rooms? Check. And food is so easily available everywhere in the office, it would be a challenge not to gain weight there! As there are more than 3 million job applications to Google, we are given crucial advice by the HR and existing CJBS alumni on how to stand out from the crowd and to succeed in the interview process. The last stop for the day was Maersk Management Consulting. They provided a great overview of how they are structured globally as well as the key differences between in-house and external consulting firms. They also have a clear training programming to equip the team with consulting skillsets, which is extremely valuable if you have no prior experience in consulting. We ended the trek with more drinks and finger-food courtesy of Maersk. As we reluctantly exchanged our farewells, we knew that this was not the end, but the beginning of a journey of self-discovery and exploration. I have already benefited a lot from the learning experience over the two-day period and I am excited to begin the MBA programme with the rest of the cohort. We will be meeting again soon in Cambridge where we will take our first steps on our transformation journey.